1. ALL NATURAL – Jade Monk Matcha Green Tea is loaded with natural, healthy antioxidants. A single serving = 10 cups worth of green tea nutrients and contains 282 mg of natural antioxidant flavonoids, 20 mg of naturally occurring green tea caffeine, and the ORAC value is 2050 molecule te/1g. 2. HIGH IN L-THEANINE – Matcha is rich in L-Theanine, a rare amino acid that actually promotes a state of relaxation and well-being. Another side-effect of L-Theanine is the production of dopamine and serotonin in the brain. These two brain chemicals serve to enhance mood, improve memory, and promote better concentration – something that can benefit everyone! Try matcha as a pick-me-up for the afternoon or anytime you need extra focus. 3. FULL OF HEALTH BENEFITS – With 2 x the amount of antioxidants than red wine, 6 x the antioxidant of dark chocolate, 23 x the antioxidants of acai berries and 137 x the antioxidants of ordinary green tea your body will be screaming for more. Feel your body energize every time you drink Jade Monk. The first day of spring, picking fruit on Maui. 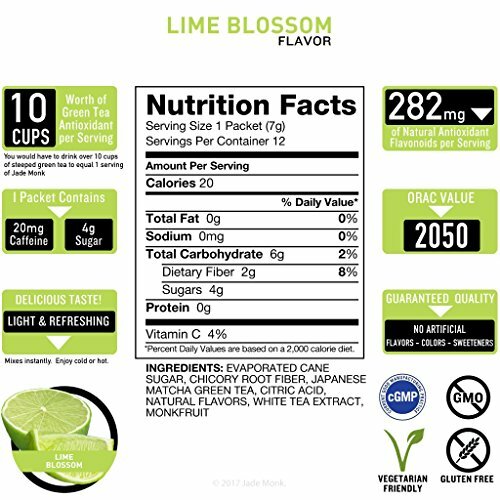 Get a taste of lime blossom matcha green tea, and no telling where it takes you. Airfare not included. Seducing your taste buds with the unexpected tang of lime, zest of peel, and aroma of spring flowers fortifying your body with enhanced matcha polyphenol potency and calming your mind with the clarifying effects of our shade-cultivated jade monk Japanese matcha green tea. Phew. 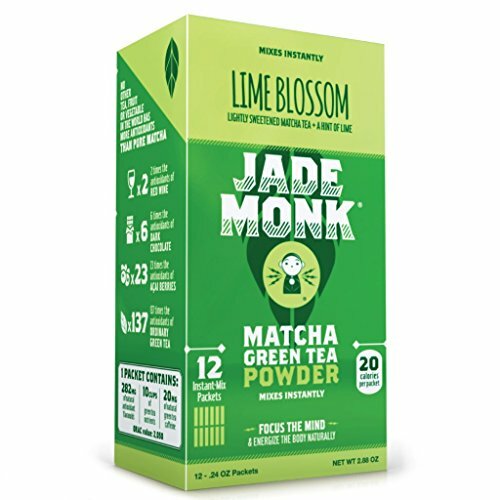 Jade monk’s lime blossom combines top of the range, pure Japanese matcha green tea with a super healthy prebiotic fiber to help with mixability and promote healthy intestinal flora. 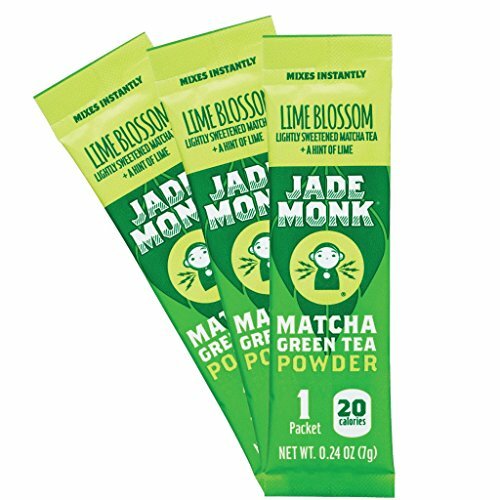 With 6 single-serve stick packs per box, jade monk’s quality and taste come from wise formulation. We source only the purest ingredients, like shade-grown Japanese matcha green tea and all-natural flavors and sweeteners. Made in the united states, we list every one of our ingredients on the label, too–nothing hidden, no marketing mumbo-jumbo, just refreshing flavors and good things for your body. Mix up, kick back, and enjoy, guilt-free. Welcome to healthy and delicious drinking. Welcome to jade monk. To serve, mix one packet with 12 ounce water. Enjoy cold or hot. Mixes instantly. 2. HIGH IN L-THEANINE – Matcha is rich in L-Theanine, a rare amino acid that in fact promotes a state of relaxation and well-being. Another side-effect of L-Theanine is the production of dopamine and serotonin in the brain. These two brain chemicals serve to beef up mood, beef up memory, and promote better concentration – something that can benefit everyone! Try matcha as a pick-me-up for the afternoon or anytime you wish to have extra focus. 4. MADE FOR EVERYBODY – We imagine in a healthy lifestyle, that is why our matcha green tea is Non-GMO, Gluten Free, Soy Free, Dairy Free, Vegan, and only contains 5 calories per packet. It doesnâ€™t matter what situation you are in, you are going to love Jade Monk. 5. EASY TO USE – To serve, simply mix 1 packet with 12 oz of water. Enjoy this tea either as a cold or a hot drink. With such a lot of different ways to drink you’ll be able to be sure to have it your way.